Four and a half billion years ago, the solar system was taking shape as heat and light from the sun blasted outwards, burning away the gas, dust, and debris around the four terrestrial planets, while the four “gas giants” and “ice giants” formed farther away. The Earth was a mass of molten rock and metal for about a billion years, spinning and becoming denser and hotter within its core. Heat from the iron core convected through a surrounding layer of molten rock where it interacted with metals in the earth’s crust, creating a magnetic field that spans from pole to pole. This magnetosphere began to shield the planet from the harsh solar winds as water vapor from the burning crust evaporated and cooled, forming the oceans. As Earth’s outer crust began to cool down, molten rock erupted and flowed beneath it, creating “plates” of land masses that continue to shift and reshape the surface. Among the first organisms to evolve were bacteria and plant matter that began photosynthesizing carbon dioxide into oxygen. As the atmosphere filled with a nitrogen-oxygen ratio of about 3:1, aerobic life began to evolve, first in the oceans and then on land as the ozone layer protected the Earth from deadly levels of the sun’s ultraviolet radiation. 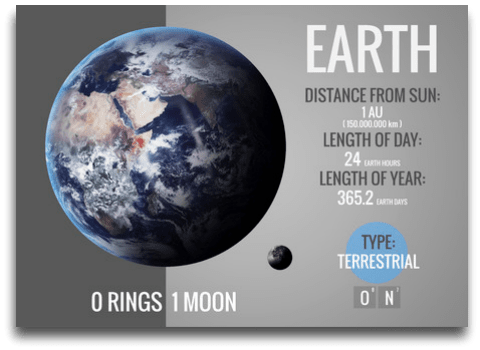 The Earth’s distance from the sun, its composition, size, and temperate regions are factors that have allowed life forms to thrive in a way not yet observed anyplace else in the universe. As the moon brightens the night sky with the reflected light of the sun, its steady gravitational force influences the ocean tides here on earth. 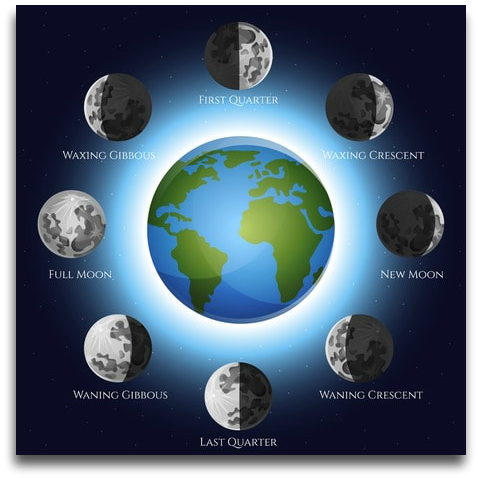 The moon completes an orbit each month and appears to transition through “phases” as the sun’s light is blocked by the earth. The moon is 238,000 miles (383,000 km) from earth, rotating on its axis at approximately the same speed that it’s orbiting the earth, and this synchronous rotation means that one side of its cratered surface is ever visible. Lunar rocks gathered by astronauts in the 1970’s revealed that the moon is made of the same type of volcanic rock found on earth, and that the moon could be the same age as the earth. Scientists theorize that a collision with a planet-sized comet named “Theia” about 4.5 billion years ago caused a mass of rock and metal to be ejected into space. Iron and other heavy elements coalesced at the core while the outer layer of molten rock began to solidify. For millions of years, the surface of the moon was shaped by asteroid strikes and erupting volcanoes that formed the craters, hills, and the “maria” that early astronomers once believed were oceans of water. Water molecules have been found in small quantities near the north and south pole in recent years, but scientists doubt that there were ever rivers or lakes of water on the moon. The lack of atmosphere means the moon is an uninhabitable place for humans, and temperatures fluctuate from 120C to -117C. The writings on Instrideonline.com are completely original and may not be duplicated, copied, or published, and derivative works based on the Instrideonline.com format are prohibited. This website is meant to be informational and entertaining only and source material is from the public domain. Please don’t download images or cartoons without contacting admin@instrideonline.com. Pictures, clip art, and cartoons are either purchased or carefully researched and used by permission. We are a participant in the Amazon Services LLC Associates Program, an affiliate advertising program designed to provide a means for us to earn fees (with no cost to you!) by linking to Amazon.com and affiliated sites.